As of January 1, 2017, DIVING FOR FUN will NO LONGER be offering training services. However, we wanted to continue to provide a list of the classes we offered along with course outlines as a reference for all our past customers. Course Overview: If you want to see the spectacular and prolific aquatic life often found in colder water climates you will need to stay warm and that means you need to dive in a dry suit. But, you should be trained in the proper techniques, this is where Dry Suit Diver Specialty course comes in. Prerequisites: Must be at least 12 years old and certified as a Junior Open Water Diver or an Open Water Diver. Course Activities: You will learn about the planning, organization, procedures, buoyancy control techniques, care and maintenance of equipment, problems and hazards of dry suit diving. Then you will get into the pool for a confined water dive to put the theory into practice. 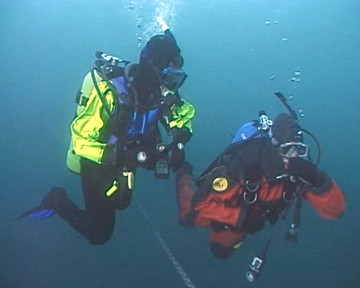 Once you have mastered the techniques in confined water, you will do two dives under instructor supervision where you will apply that knowledge, including including dive planning, organization, techniques, problems and buoyancy control. Classroom: There is one classroom session. The classroom session will cover the Dry Suit Diver Specialty Manual, review your knowledge review answers, learn how to plan a Dry Suit dive and prepare you for the 2 open water dives. Independent Study: Read the Dry Suit Diver Specialty Manual and complete the knowledge review located at the end of the manual. You will need to turn in the knowledge review prior to certification or provide a copy of an Adventure Log signed by an appropriate instructor if you have already done dive one in connection with your Adventure Diver or Advanced Open Water Diver Certification. 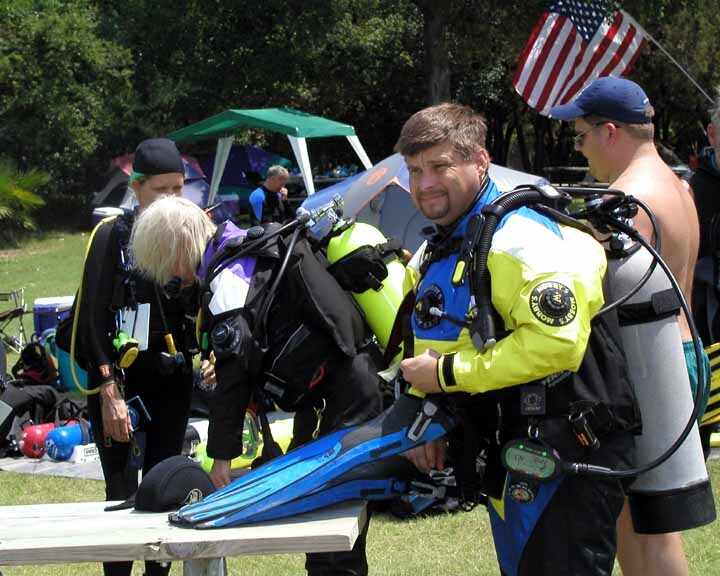 Open Water Dives: The 2 open water dives are done at an area lake/scuba park or on a dive trip. Forms Required: Students training will need to complete the three (3) forms: Liability Release, Statement of Understanding, and Medical Statement prior to entering the water. Length of Course: If you have read the Dry Suit Specialty Manual, completed the knowledge review prior to coming to class then the classroom will last approximately 1 hour depending upon class size. Related Specialties: Project AWARE, Boat Diver, Coral Reef Conservation, Deep Diver, Drift Diver, Dry Suit Diver, Enriched Air (Nitrox), Equipment Specialist, Fish ID, Multi-Level Diver, Night Diver, Peak Performance Buoyancy, UW Naturalist, UW Navigation, UW Digital Photo, UW Photo, UW Search & Recovery, Wreck Diver. Don and Doff a dry suit with the aid of another diver. Purge excess air form suit. Perform pre-dive safety check. Check dry suit valves, seals, zipper, potential leaks. 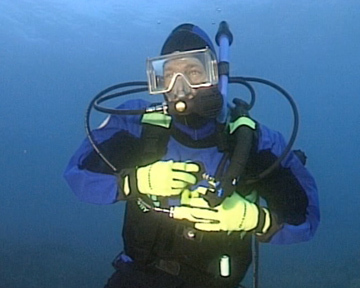 Demonstrate the procedure for conducting a buoyancy check while wearing a dry suit. Perform a controlled descent, avoiding suit squeeze. Neutral buoyancy - fin pivot for one minute. Neutral buoyancy - hovering for one minute. Dry suit dive for fun and experience. At the surface, achieve comfortable positive buoyancy using BCD. Remove/replace both the scuba unit and weight system at surface. 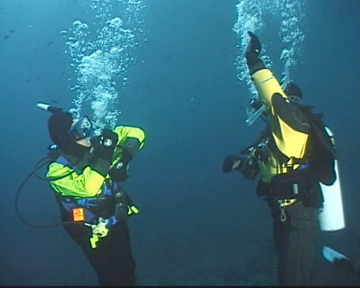 Disconnect and reconnect the low-pressure hose from dry suit inflator valve while underwater wearing gloves.